When it comes to basement ideas, literally, the sky is the limit! If you are planning on upgrading and improving your home by enhancing your downstairs, you have come to the best place to find assistance, get ideas and find solutions. If it seems like we’re serious about your basement, it’s because we are. It won’t be long before your downstairs is transformed into this! When it comes to basement ideas, literally, the sky is the limit! If you are planning on upgrading and improving your home by enhancing your downstairs, you have come to the best place to find assistance, get ideas and find solutions. Got questions? We have the answers! If it seems like we’re serious about your basement, it’s because we are. It won’t be long before your downstairs is transformed into your own oasis! From Basement Ideas To Dream Come True! Did you know that the basement is one of the most under utilized aspects of the home? Many homeowners in the Midwest and Central regions of the United States have a lot of space they can remodel to fit their needs but they lack ideas. Why? Just look at the past. Historically speaking, the basement started out as a shelter slash safe haven. It was the place families ran to in the event of tornadoes. Basements were also used as staging places for coal fired furnaces. The furnaces and coal were all built into the downstairs area away from the main living quarters. Finally, some homeowners opted to build basements to store vegetables and fruits during the winter months. Basically, the basement had a few practical uses and that was it. They were small in size and no one thought of using the downstairs area as a living space or as a place to entertain. However, with the inception of modern technology combined with the latest safety specs, housing codes and FEMA planning, basements are no longer a necessity as they were back in the day. Actually, there is a good chance basements are not needed at all. So, why are modern basements, so popular? Even in areas such as the West Coast? The answer is simple; basements provide a living space second to none! Hidden away from the kinetic chaos of the upstairs, the downstairs has a way of bringing life into an otherwise mundane home. What Are Some Of The Top Basement Ideas? After being in the business for over 23 years, I’ve been privileged to remodel some amazing basements and witness first hand how homeowners have gravitated towards the downstairs. As a result, I clearly have an infinity for everything basement. My man cave is where dreams come true! Hopefully, your basement can become the epicenter of household happiness. Here are some of the top ways homeowners develop this space. Keep in mind, these are in no particular order. We’ll begin with the practical. The living room of old is quickly going the route of the dial up Internet. Nowadays, the basement space is fast becoming the place where families hang out together. Most noteworthy? One of the great thing about having your living room downstairs is that you can keep the rest of the house in pristine shape while the basement living room can be in a mess! Families, big and small love this basement idea! On the surface, a guest bedroom downstairs seems odd, but in reality, it provides your guests with a great deal of quietness when they need to sleep and/or want to be alone. This is premise is based on the belief that you crafted this space with privacy in mind. This goes back to laying out the proper basement design from the beginning. Plan to give your guest bedroom an aura of seclusion, serenity and tranquility. No matter if a family is small, mid size or large, having a separate wash room makes a huge difference. Having a wash room in the basement, tucked away from the rest of the house, makes doing laundry a more palatable task. You can hang dry delicate clothing articles, have a section for ironing and even have an area for fold and fluffing. 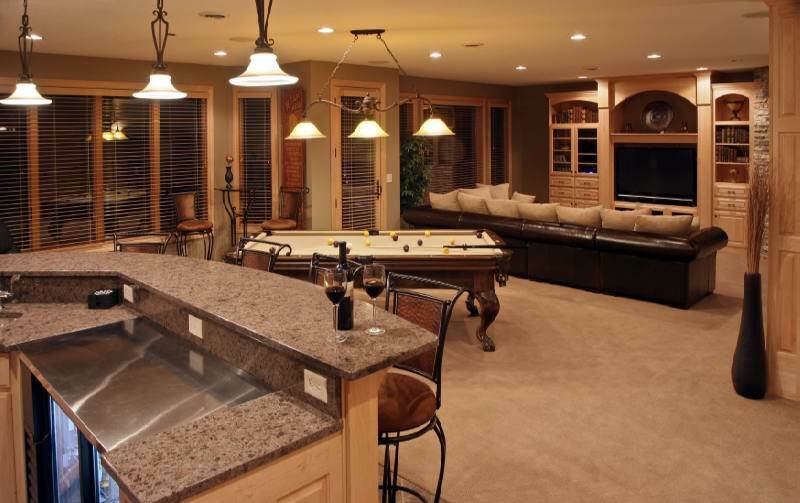 Basement Ideas That Bring The Fun! These rooms transform any basement into an entertainment juggernaut. Generally speaking, these rooms include a large Flat Panel TV or a large projector screen, plush seats and a surround sound system that can make you feel like you are in a dream. The beautiful thing about media rooms is that they can fit any budget, but still look like you invested tens of thousands of dollars. This is one of those basement ideas that pays of huge dividends in endless family fun! Whether you love playing billiards or not, adding a pool table to your basement has a tendency to cause one to fall in love with the game. Pool tables are a lot a fun! Who knows, someone in your family could become the next billiard pro with enough practice. Forget Xbox?!!! When you add a game room to your basement, the game changes! A game room can include, but not be limited to: pinball machines, a ping pong table, an air hockey table, table tennis, arcade games, darts, a foosball table, a poker table, and the list goes on. The only rule that comes into play when it concerns a game room is this; there are no rules! When upgrading and/or renovating your basement, your first thoughts should be: comfort, access, enjoyment and of course, counting the costs. That means examining: basement finishing costs, basement ceiling options, lighting, flooring, bathroom upgrades, walls and finally tallying up the decorating costs. As you can see, no matter the size of the project, careful consideration must be applied at every stage. That stated, here are some additional basement ideas for you to consider. Nothing beats an office space like the tranquility of the basement! You can escape the hustle and bustle of the kids, the house phone, the mail man, the UPS man, the FEDEX man, the landscaper and all of the people and instances that would inhibit your ability to get work done. This is one of those practical basement ideas that will make working from home a productive joy. Lets get physical! This is one of those basement ideas that every homeowner should consider. A basement exercise room has become more than a fad; it has become “THE”place to workout. Think about it… no more gym fees. No more sharing equipment with strangers and being forced to wipe off their sweat. Your own indoor gym means you are the master of your workout domain! Yoga class is in session, free weights, Bowflex Max Trainer, Weider Pro, Nordic Track Treadmill, whatever you can imagine and afford, it’s your basement, go for it! Having a breakfast nook in your downstairs area is like being in a fine restaurant hidden away in the VIP section. Since you are secluded and shuttered from the noise, chatter and distractions, you can enjoy your meal, company and conversation and never be worried about what’s going on throughout the rest of the house. This type of upgrade typically includes plumbing and electrical work and may require basement house plans designed by professionals. If you have little ones, kids or teens, setting up a contained area where they can be who they are, will make your life a lot less stressful. Once child proofed, these areas offer space where your loved ones can play, rumble and tumble, relax, learn and/or take a nap. Depending on the square footage, you can go from a small play pen to an elaborate kid’s room. Kids love to play; that is no secret! By installing an indoor play pen in your basement, you get to keep an eye on the little ones and have none of the safety concerns you would have if they were outdoors. Outside, you have to be mindful of strangers; not so much inside your basement. Another advantage of utilizing your basement in this way is avoiding inclement weather. Kids always find these downstairs play pens to be tons of fun! All it takes to turn part of your basement into an incredible kid’s room is some parental creativity, some time and a little money. First of all, start with an overall theme. Any Trekkers in your house? If so, how about a Star Wars theme? What about Spider Man, Barbie, the NFL, the NBA, or whatever it is that your child or kids gravitate towards. Just remember, kids will be kids. Consequently, what they love today, may become loathed tomorrow, LOL. In spite of the whimsical nature of adolescents, when designed properly, these rooms are known to become the hub of household fun. The proverbial, “Man Cave” all started when men began to take sanctuary in their basements. It is the place of escape a man can slip into – to wind down after a hard day’s work. Or, it can be a place of absolute game day testosterone. Either way, one is unlimited in the number of ways to make this basement idea come to life. 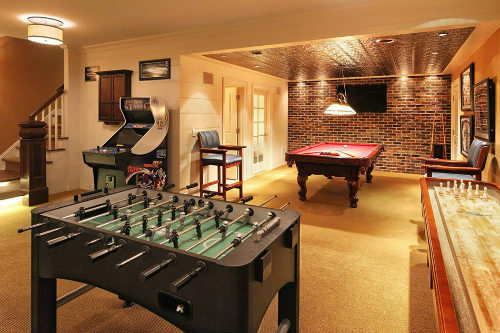 Man Caves can include any and everything that a MAN can think of and can afford. Having your own basement bar means that you are serious about entertaining. It also means that you have reached the epitome of success. With this add on, you have an assortment of layouts and themes. You can go with a full wet bar that includes beer, wine and mixed drinks. You can go with any of the popular bar themes such as an English Pub, a contemporary bar or an all out eclectic bar, complete with seats, lighting and the whole nine yards. There is a host of other ways to utilize your downstairs. Using the above basement remodel ideas, you can start the process of determining the type of investment you will need to make. That means determining basement renovation costs. Still undecided? Need More info? We have plenty more basement ideas, tips and advice, so look around.